"How do you take care of human hair extensions?" Taking care of human hair extensions is just as important for your hair extensions as it is for your own growth hair and maintaining hair extensions (or hair extension maintenance) can be divided into three areas; daily styling products and tools; nourishing (hair oils and moisturizers) and conditioning; and keeping the hair clean - washing the hair. 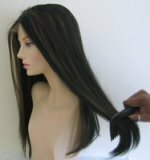 Below is an outline of the general and basic steps for taking care of any type of human hair extension. Any kind of styling products can be used including oils, sprays, waxes and mousses - you name it, you can use it. Keeping the hair hydrated is essential to keeping it in good condition is which means one thing and one thing only; moisture. Human hair needs moisture in order or it to maintain elasticity and prevent if from becoming brittle. Moisturize your hair extensions (and your own growth hair) on a daily basis. A light misting of a light spray moisturizer from the bottom up should do the job. Ideally soft bristles without the balls at the end of the bristles so that they don't catch on any bonds, clamps, rings or tracks (attachment points for your hair extensions). Any combing or brushing should always start at the ends of the hair first and then move upwards and if it's possible, keep it to twice a day, three times at most. If your hair extensions are curly then keep it to when you style your hair for the day using your moisturisers and use wide tooth combs to prevent the hair becoming frizzy. Hair oils are great for keeping human hair supple and smooth. Nourishing hair oils can be used to smooth frizz and when applied to damp hair they can seal moisture into the hair to prevent it drying out. Some of the best oils (and butters) to use on hair include almond, argan, avocado, castor, cocoa, coconut, jojoba, olive, rosehip and shea. All of the oils listed above penetrate the hair but coconut oil is the best at penetrating and repairing hair. Conditioners repair and strengthen hair by replacing lost proteins; but protein conditioners also dehydrate hair. The two ways to combat the dehydrating impact of conditioners is to use a moisturizing conditioner - one with oils which will seal in the moisture (water); or moisturize your hair extensions after deep conditioning. If conditioning your hair extensions in the conventional sense isn't possible, the a leave-in conditioner is a great substitute especially for braided human hair extensions, fusion bonded hair extensions, glued in hair weave extensions and micro ring hair extensions. Whatever the type of extension – if it’s going to be on your head for longer than two weeks then you are going too have to wash your hair – for the sake of your growth hair. If the attachment is fragile, or if the type of hair extensions used are prone to being damaged by vigorous washing then use the cheating method for washing your hair. Two capfuls of shampoo and several litres of water – and run this trough your hair, gently massaging your scalp with your finger tips. Easy peasy. Do this a couple of times and then rinse through with water to make sure there isn’t any shampoo residue left in your hair or the hair extensions. Once a week using a basic shampoo for coloured hair (preferably free from SLS and SLES as these can be harsh on hair) should be adequate. If you can stick to these basics of hair care then your human hair extensions should look good for the duration and if you'd like specific guides for hair extensions, then check out the hair weave care guide, the micro ring care guide and the clip hair extension care guide. There are more answers to questions in the Hair Extension Q&A section or if you'd like to be first to read new guides and articles, why not join our blog - it's super easy to do and doesn't require any personal info!